What happens when you lose track of why you’re doing something, something you’ve been doing your whole life? When you forget why you ever started, you fall out of love with the thing and in the process of doing so, you lose all sense of who you are? And then you find a new thing, quite unexpectedly, and you love that thing so much it changes how you feel about EVERYTHING? These questions, combined with the death of a certain rockstar, set me off on a journey last year. This show was the result. Or, at least, the start of the result. I realised I’d been a bit lost for a while. Not actually geographically lost, although that has happened too, but just a general feeling of losing my bearings and things not quite ending up how I thought they would. And then I started to explore how I was feeling, and why, and I started to make some decisions and I decided I was ready to move on. Not just in the harp sense but in the life sense too. For this gig, I left my ginormous spangly concert harp at home, and took my electric harp for its first proper public outing instead. 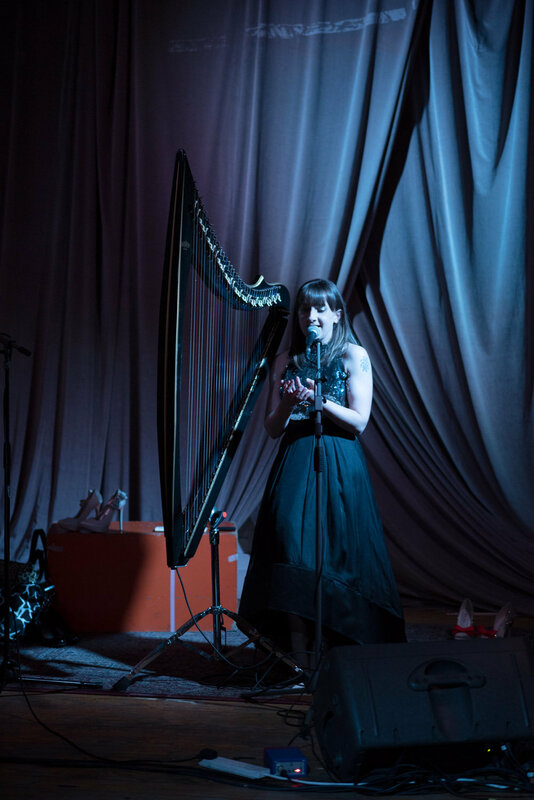 There were songs, stories and a couple of pieces written for solo harp, plus my singer friend Frankie Phoenix joined me for a couple of tunes too. There were originals, covers, tales from the past and hopes for the future and I can't wait for the next one! The stage was set. This was like nothing I had ever done in my life, and I was terrified but excited. One of the most important parts of the gig for me was performing a spoken word piece called The Coins and The Kindness. This was the story of a rather eventful run over Conic Hill on the West Highland Way on a cold and snowy January day. It featured a simple loop which I embellished with some harpy chords. My dear friend Frankie travelled all the way from Liverpool just to sing a few of our favourite songs. It was great to share the stage with her again, and it meant I felt a little bit less alone under the bright lights. This gig was the most personal and the most innovative one I've ever done. It was a scary experience but a wonderful one too, and I'm working on the next one as we speak.